India's national carrier Air India changed the way it describes Taiwan to "Chinese Taipei" as of Thursday, a move that observers said shows the company's respect for Chinese laws and offers a lesson for other carriers that still flout China's sovereignty. The Global Times saw that as of Thursday, when searching on Air India's website, the way Taiwan was referred to in the drop-down list had changed to Chinese Taipei from an independent country - the way it was referred to before. Responding to the change, Lu Kang, spokesman for the Ministry of Foreign Affairs, said at a press briefing on Thursday that the Chinese government recognized the move of the airline. "There is only one China in the world, and the island of Taiwan is part of China… Air India's move shows its recognition of the international consensus," he stressed. Liu Xiaoxue, an associate research fellow at the Chinese Academy of Social Sciences' National Institute of International Strategy, told the Global Times Thursday Air India's decision shows its willingness to woo Chinese travelers as the number of Chinese tourists to India is expanding rapidly. Currently, Air India operates two direct flights daily to China, serving Shanghai and Hong Kong Special Administrative Region. Air India had not responded to an interview request of the Global Times as of press time. 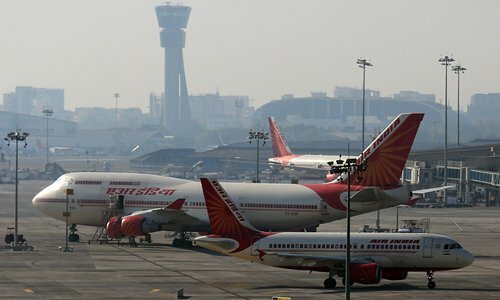 An unidentified Air India spokesperson indicated the change was made with the approval of the external affairs ministry, according to a report of the Hindustan Times on Thursday. Amid warming Sino-Indian relations, Liu suggested the change shows that the Indian government may be "trying to court" China with a goodwill gesture. An Indian university professor said in June that Air India should not change its policy on Taiwan unless "China recognizes India's territorial claims," a Taiwan-based news website reported. Industry insiders pointed out that China established diplomatic ties with India on the condition that India recognized that the island of Taiwan is part of China. The professor's claim, therefore, is "ridiculous," Liu said. Lu also said at the press briefing that "any foreign firms that operate in China should respect China's sovereignty and territorial integrity, follow China's rules and respect the feelings of Chinese nationals." On April 25, CAAC asked 44 foreign airlines to change how Taiwan is described on their websites. As of the end of May, 18 of those airlines had made the change as required, while the remaining 26 airlines had asked for extensions due to technical issues. The deadline has been extended to July 25. Some carriers including US-based United Airlines and Delta Air Lines have yet to modify their references to Taiwan on their websites. Liu warned that as the deadline draws near, if those airlines still refuse to recognize China's territorial integrity, Chinese residents could "vote with their feet" and kick them out of the market.